It’s the 4th annual Lealand McSpadden Classic featuring the USAC Southwest 410 sprint car series along with IMCA Modifieds, IMCA Sport Mods, Dwarf Cars, Robert Horne Ford Bombers and Easter egg hunt. 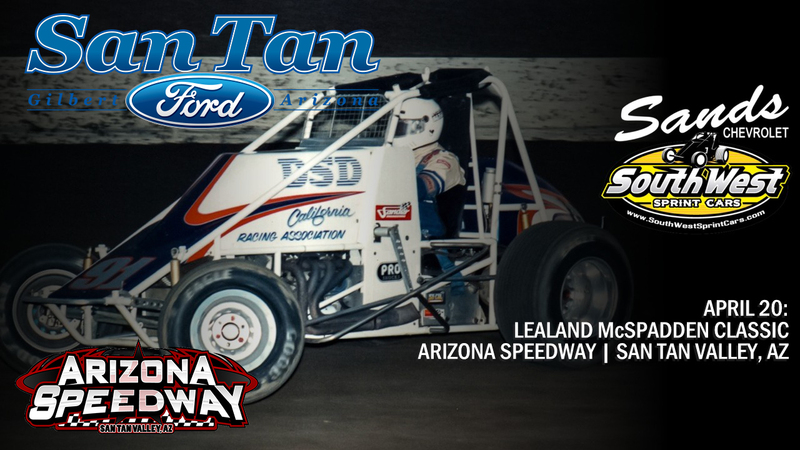 The first trip to the speedway in 2019 for the USAC contingent will be a bountiful one in celebration of the “Tempe Tornado” Lealand McSpadden. On top of the $2000 winners share, the McSpadden’s have generously generated extra income for the drivers from sponsors and fans alike. An additional $100 per lap will be split between the top 3 positions for the 30 lap feature with the chance of the victor taking home $3500 on the evening. Also before the USAC main event will be and Easter Egg hunt with the drivers and kids on front straight way. Zachary Madrid leads the IMCA Modified division rolling into the Saturday night feature just 2 points ahead of Kelsie Foley who has 2 wins on the season and one at the Speedway. Chase Rudolf is at the top of the IMCA Sport mod division leading Ty Weidner and reigning champ Mark Harrison by 5 and 6 points. Robert Horne Ford Bombers are entering the night with Michael Soboski leading current champ Jason Knueppel and Aaron Collier who are tied with 143 points each. Dwarf cars return for the second time on the year with John Foster leading the group followed by Dusty Jager and Eric Muse. Action begins at 7:00pm Saturday April 20th at Arizona Speedway with grandstands opening at 5:00pm and pits opening at 4:00pm. Cost for admission just $18 for adults, $15 Seniors. Kids 11 and under are free. Pit passes $35 , kids 6-11 pit passes $10 and kids 5 and under free. Arizona Speedway is located within ET Motopark at 48700 N Ironwood Dr. San Tan Valley, AZ 85140 5 miles south of US60 on Ironwood dr. Call the hotline for more info. 480-926-6688 . Follow us at www.Facebook.com/ArizonaSpeedway .